If you see white reflex in a photo of your child, compare it to other photos in the set. Use the PhotoRED technique we describe to check for red reflex. 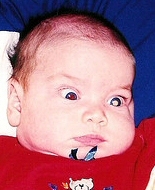 Look at previous photos of your child as well, to determine if this has happened before. If the pupil appears white in one photo, while all other photos show red reflex, the camera has most likely captured normal optic nerve. Pseudoleukocoria may also appear in several photos taken from the same angle. We advise that you request an eye exam from your primary doctor or optician, to confirm the eye is healthy. Both eyes should be examined with an ophthalmoscope (looks like a handheld torch) in a darkened room. We suggest you take the photos and a print-out of this page to the doctor, to help them understand your concerns. a squint (misaligned eyes) in a child older than six months, or younger than six months if seen in combination with any of the above. 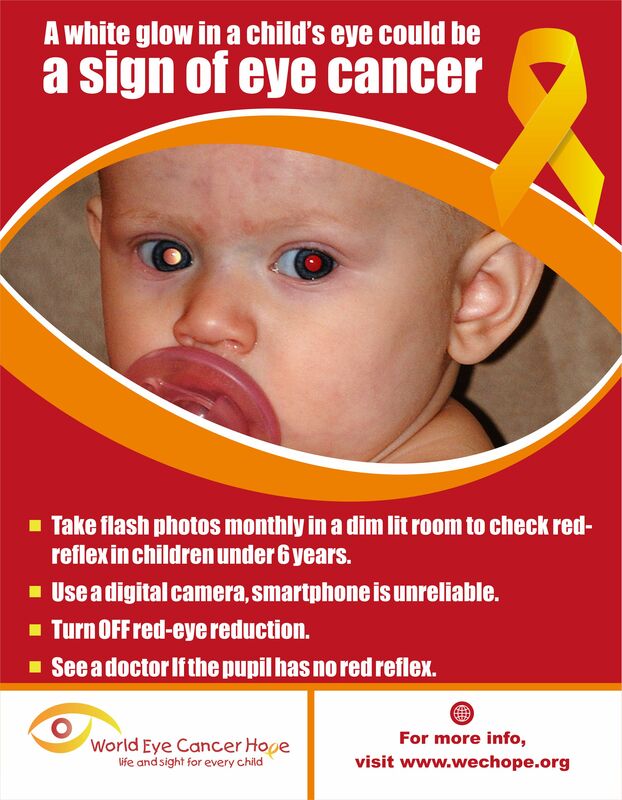 We recommend children with one or more of these signs be seen by an ophthalmologist within 72 hours. We suggest you take the photographs and our awareness poster to your primary doctor, to help them understand your concerns. Retinoblastoma should be considered the most likely diagnosis when the eye repeatedly reflects white or absent red reflex in young children. Both eyes should be urgently examined by an ophthalmologist. Children do not die from primary tumours in the eye, but from cancer that has spread beyond the eye due to late diagnosis. Correct eye exams at regular well-child visits, and prompt investigation of any concerns should ensure that retinoblastoma never remains undetected. If you are reading this because you are concerned about photographs of a friend’s child, please do share your concerns with the family. Ask them if they have noticed an unusual appearance of the eye in photographs, and encourage them to look at this page. Remember that white pupil in a single photograph is usually a normal optic nerve reflex, but the eyes should be examined to be sure both eyes are healthy. Click on the poster to download and print a high resolution copy.